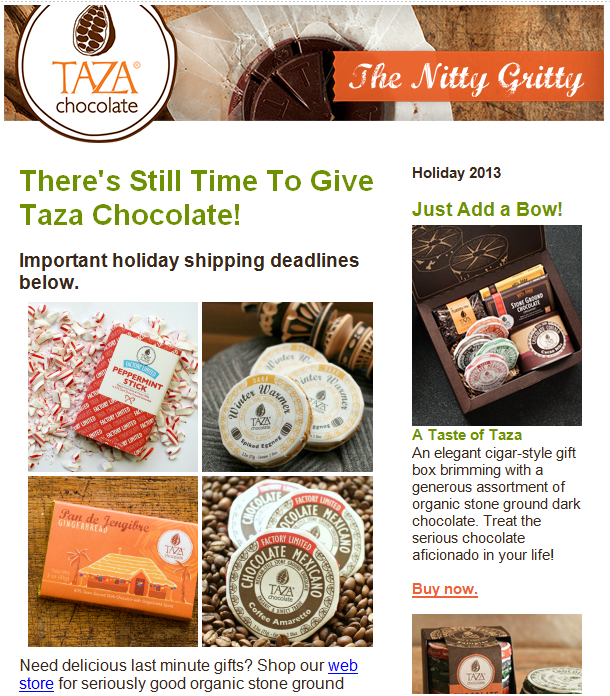 ﻿ 30 Creative Ideas for Your Holiday Email Marketing » Red Mango Marketing! 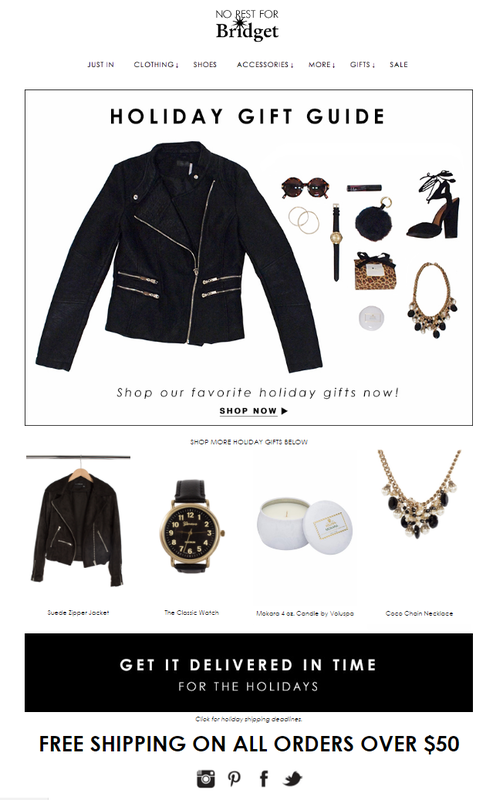 Do you know what you’re sending your email subscribers this holiday season? 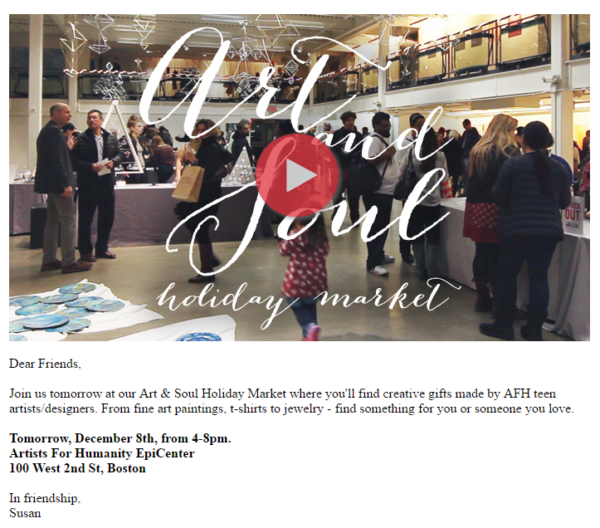 Start with the perfect holiday email template. Then, customize your message to show off your unique products, services, or mission. 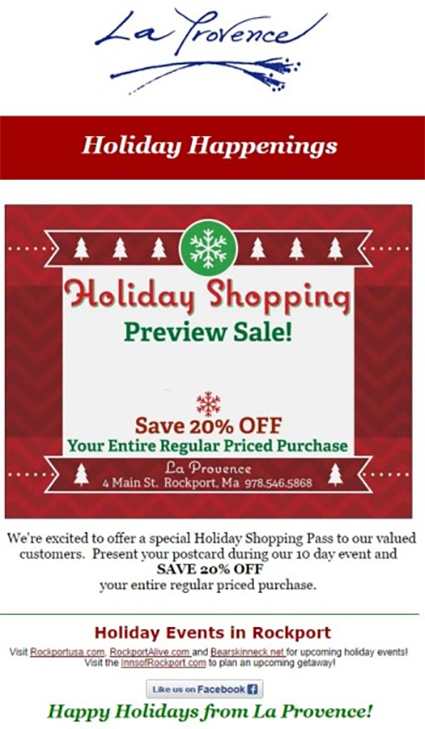 Give your audience the chance to beat the holiday rush — bring people into your store early with a holiday preview sale! You can encourage current customers to bring their friends, and even offer additional discounts to them for helping you spread the word about the event. Bonus tip: When hosting a sale early in the season, make sure to offer a convenient way for new customers to sign up for your email list. Let them know you’ll be following up with more updates about holiday offers later in the season. If there’s an e-commerce side to your business, make sure to participate in the annual online shopping event, Cyber Monday. 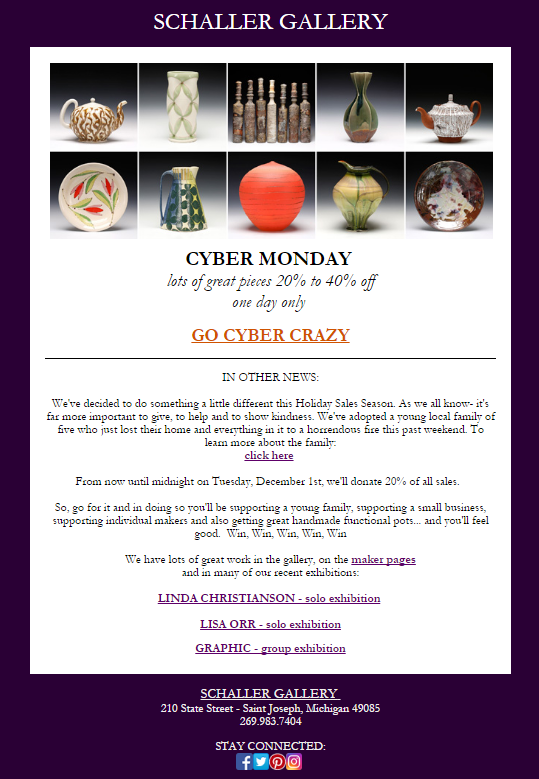 You can send a series of emails leading up to Cyber Monday letting people know about special discounts, and send a final reminder when the big day finally arrives. This year, Cyber Monday takes place on November 28th. There are many small things you can do to add value this holiday season. One of the easiest ways to add value is to offer free shipping leading up to the December holidays. You can encourage people to shop online or provide details so that customers can call to place an order. In addition to traditional discounts, you can also look for ways to reward people for shopping small by adding a bonus prize, like a gift card or gift certificate. Help your customers find the perfect gift with a holiday gift guide. You can send a general mailing to your entire list, or create separate lists for different audiences and come up with different gift ideas for all of your different audiences (gifts for moms, gifts for your husband, gifts for your grandkids, etc). Bonus tip: Constant Contact makes it easy to segment your mailing list based on interest, location, and other relevant criteria. Visit our Contact Management Resource page to learn more. Coupons can be used in a variety of different ways throughout the holiday season. You can use them as the focus of your email, or add a coupon to your regularly scheduled email newsletter as an extra bonus for your readers. 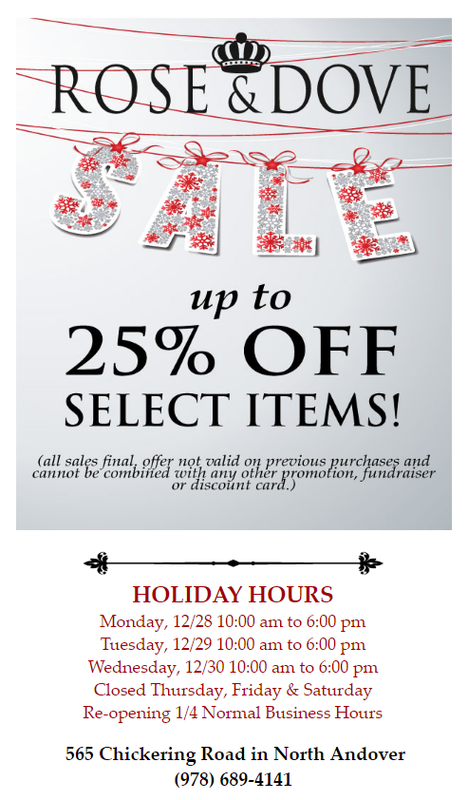 Showcase some of the different products you offer with a holiday sample sale. 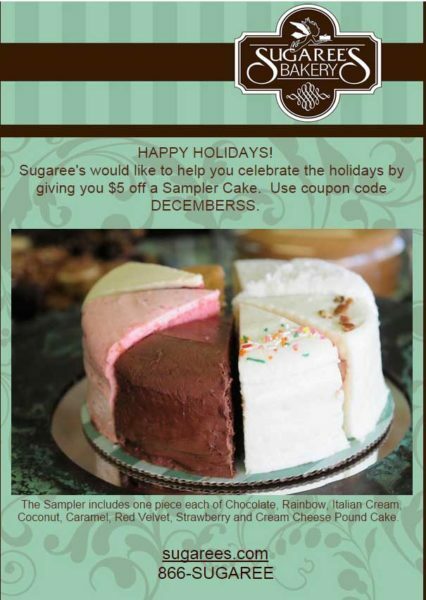 For a business like Sugaree’s Bakery, a sample sale lets customers experience their different recipes and share with holiday guests. Think of ways you can let people sample your products and services this holiday season. One of the best ways to celebrate the holidays is to reflect on all that you’ve accomplished in the previous year. As a small business, you share a special connection with your customers and they’ll be happy to hear about all of your success. 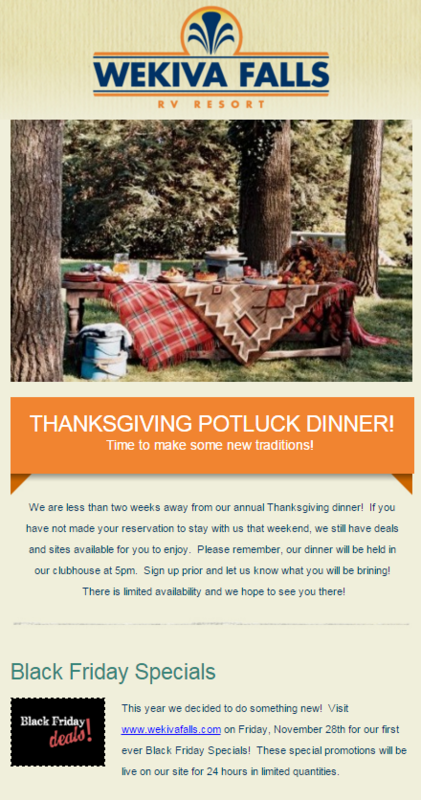 Use the holidays to say thanks to your loyal customers and give them something to look forward to in the New Year. Keep customers up-to-date about any changes in your schedule throughout the holiday season. Customers will be thankful for the reminder, and will be more likely to fit you into their holiday shopping plans. A successful holiday season can help you end the year on a positive note, and can also set you up for success in the New Year. 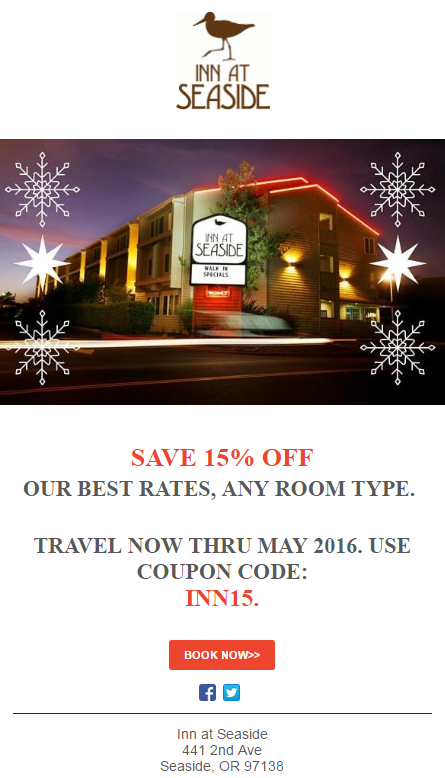 Start your holiday season early by offering fall discount — like Halloween specials. 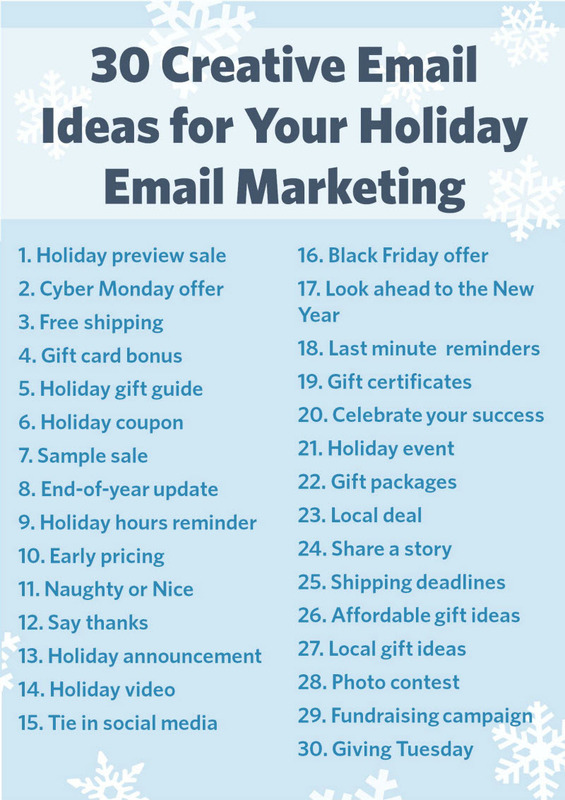 With so many businesses vying for your customers’ attention during the holidays, you’ll need to come up with creative ideas to get your emails noticed. 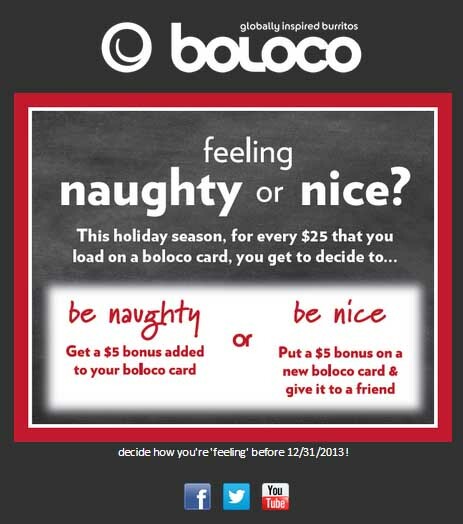 Boston-based burrito restaurant Boloco, uses humor to make a lasting impression, while also promoting their holiday special. 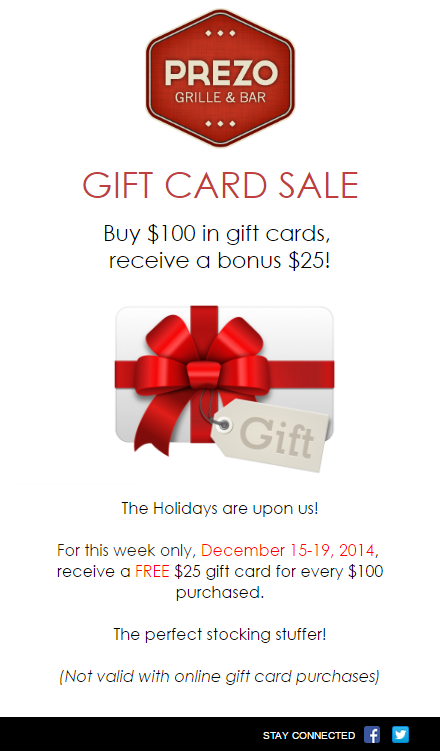 A successful holiday email promotional plan will include a mix of announcements, reminders, and thank you emails. Think about the big things you’re promoting this season. For some businesses it may be an annual holiday sale or event, or it could be a new line of products for the holidays. You can use a holiday announcement to get the word out early and start the season off on the right foot. 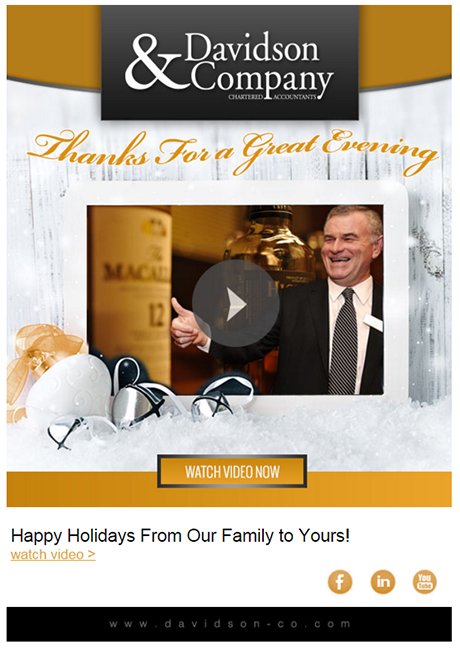 Add some personality to your holiday emails with a special holiday video. You can use video to go behind the scenes and let people know how you’re preparing for the holiday season. You can also showcase your employees or just use the video to say thanks for a great year. Bonus tip: Smartphones make it easy to create professional-looking videos on a budget. Here are 6 examples of videos you can create without spending a dime. Offer people multiple ways to connect with you this holiday season. In addition to traditional methods like phone or email, you can also encourage people to connect with you on social media. Bonus tip: Even if you don’t have an e-commerce side to your business, you can still use social networks like Instagram, Pinterest, and Facebook to showcase your different gift ideas. Consider creating a special board of gift ideas on Pinterest and promoting it to your email list. Black Friday isn’t just for the big-name retailers. As a small business, you can create a special Black Friday offer and take advantage of the rush around the holiday shopping weekend. This year Black Friday takes place on November 25, 2016! 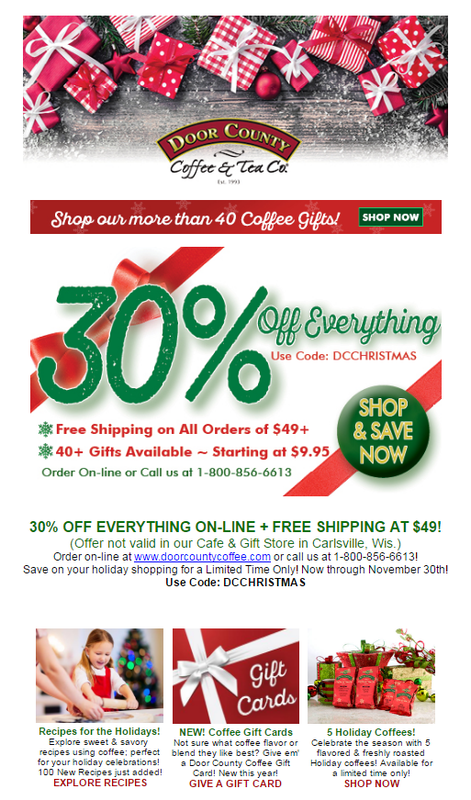 Bonus Offer: Constant Contact’s holiday email templates make it easy to promote your Black Friday offer. You can customize the email to fit your brand and quickly add details about your deal. If you don’t have a lot going on during the holidays but have big plans for 2015, you can use the holidays to promote your upcoming activities. Use online registration to make it easy for people to sign up in advance. Don’t forget to factor your last-minute email reminders into your holiday planning. You can come up with a list of last-minute gift ideas and promote them in the days leading up to the December holidays. 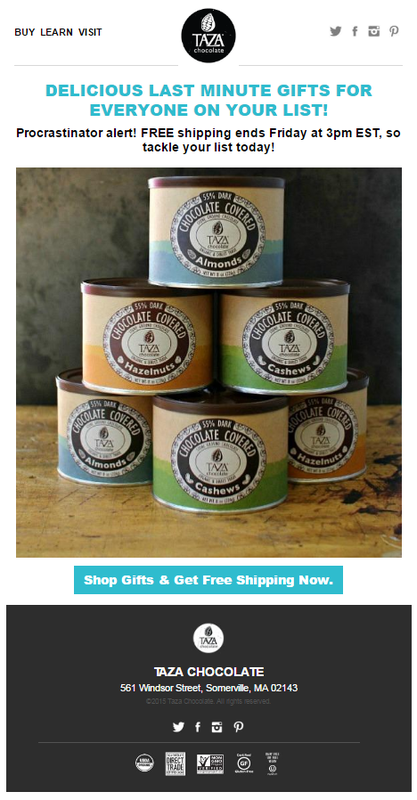 Or help customers find last-minute decorations for their holiday parties. 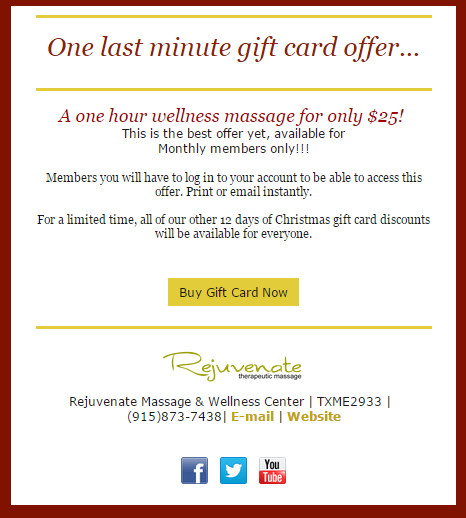 Don’t forget to offer gift certificates as a gift idea this holiday season. This can be especially effective later in the season when people are looking to pick up last-minute gifts. Were there certain projects or achievements that really stood out for your business in 2016? 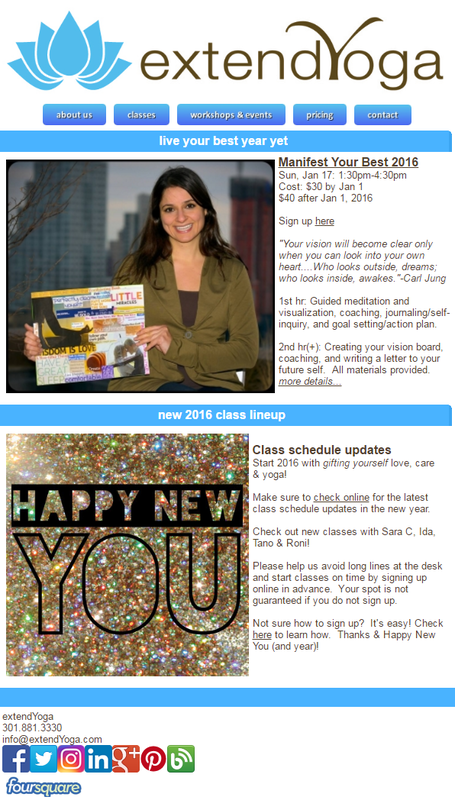 Make your email subscribers feel appreciated and include them in your celebration. Hosting a holiday party is the perfect way to thank employees and customers for their continued support all year long. After all, they are the backbone of your business and you want them to know just how much you care. Put a holiday wrapping around some of your products and services to create special gift packages. You can create packages that are unique to your different audiences, and add value without adding a discount. 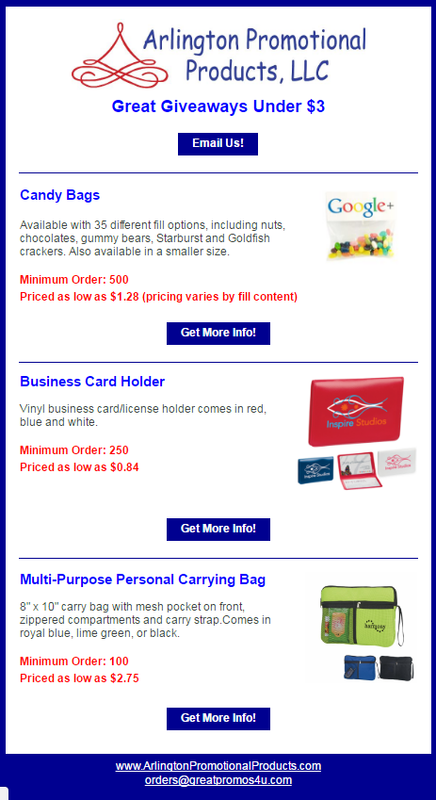 Plan a special offer for “early bird” shoppers and promote it to your email list. 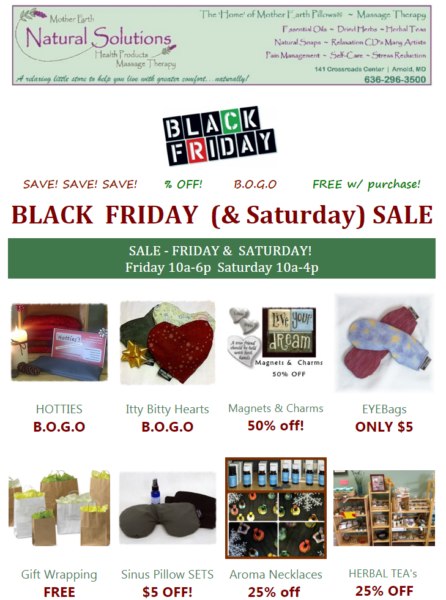 Here’s an example of how 3 Kittens Needle Arts promotes Small Business Saturday shopping to their subscribers. The holidays are a great time to make a more personal connection with the people who support your business. 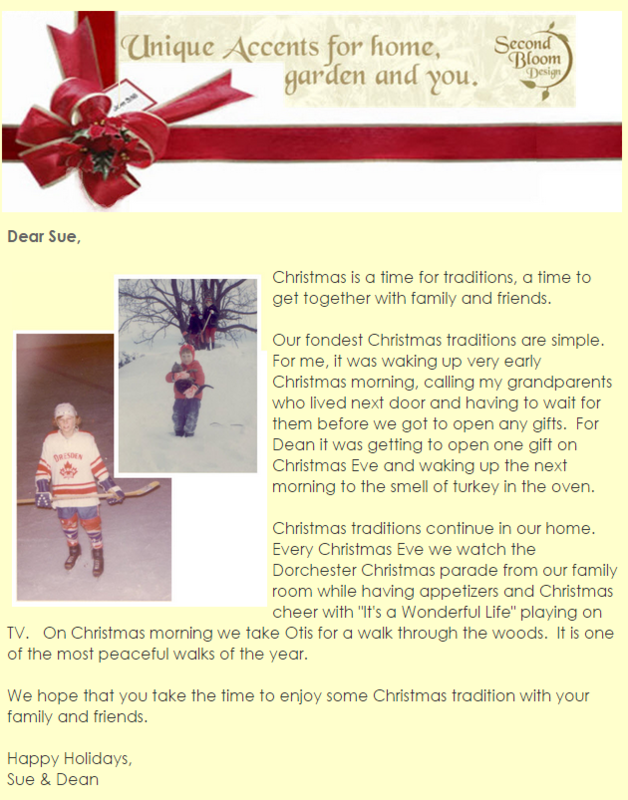 Share a story about how your family celebrates the holidays. 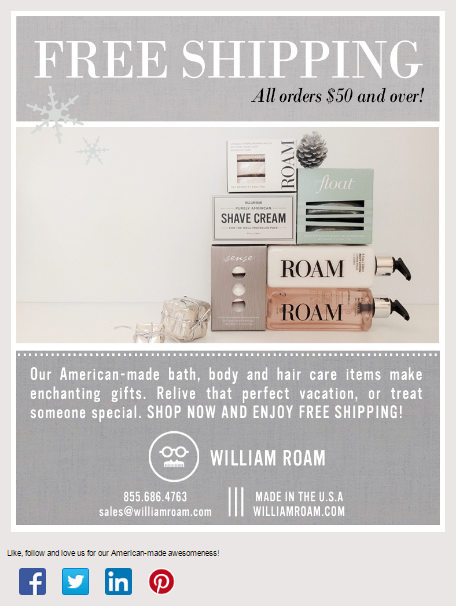 Adding a personal touch to their holiday newsletter resulted in Second Bloom Design’s biggest order of the holiday season. People need all the help they can get when it comes to keeping track of important dates and deadlines during the holiday season. Email is one of the most reliable tools you can use to notify your audience about any important deadlines. Help people find the perfect gift on a budget with an email that shows off some of your affordable gift ideas. This is a great way to bring people into your store so that you can show off all the other great products you have to offer. There are a number of benefits of shopping small during the holiday season. Use these benefits to your advantage. 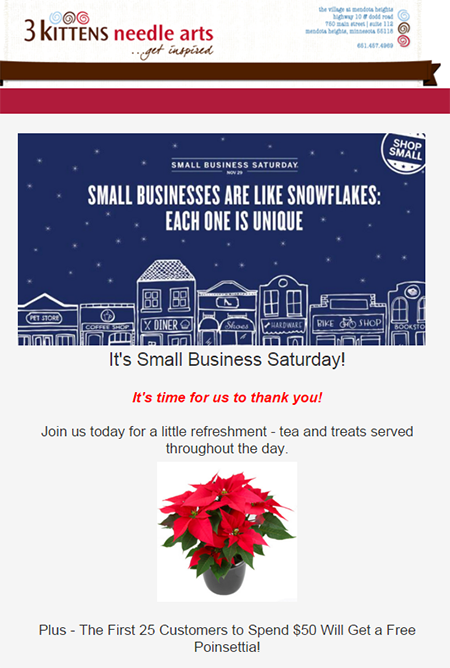 Show off the personal touch your business offers, and encourage people to “beat the crowds” by shopping small. Contests are a great way to celebrate the holidays with your biggest fans. Boston-based burger restaurant Tasty Burger, created a fun “12 Days of Ugly Sweater” contest, and encouraged people to share their best photos on social media. This is a great way to engage your audience and have some fun during this busy time of year. 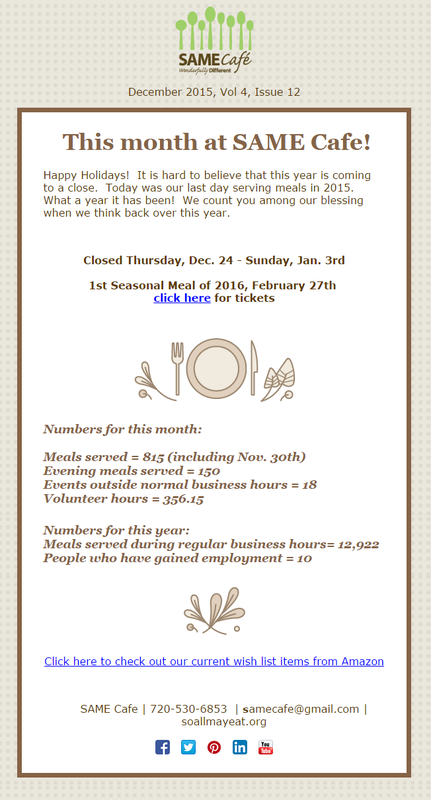 Celebrate the “Season of Giving” by supporting one of your favorite organizations. You can donate a portion of your sales, or come up with different ways that encourage people to interact with your business and donate. Giving Tuesday is a national day of giving, following the busy holiday shopping weekend. This year, Giving Tuesday is on November 29! If you’re a nonprofit, you can take advantage of this important day by running a fundraising campaign. Turn these ideas into action! Constant Contact’s email templates make it easy to get your email marketing done — fast. Our customizable templates for the major holidays like Black Friday, Small Business Saturday, Cyber Monday, and #GivingTuesday save you time and make you look good in any inbox. Try our templates out for free! Start your free 60-day trial today! Already a Constant Contact customer? Log in now to create your holiday email now. Editor’s Note: This post was originally published in October 2014 and has been updated for relevancy and accuracy. 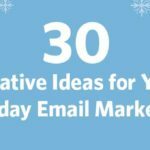 The post 30 Creative Ideas for Your Holiday Email Marketing appeared first on Constant Contact Blogs. 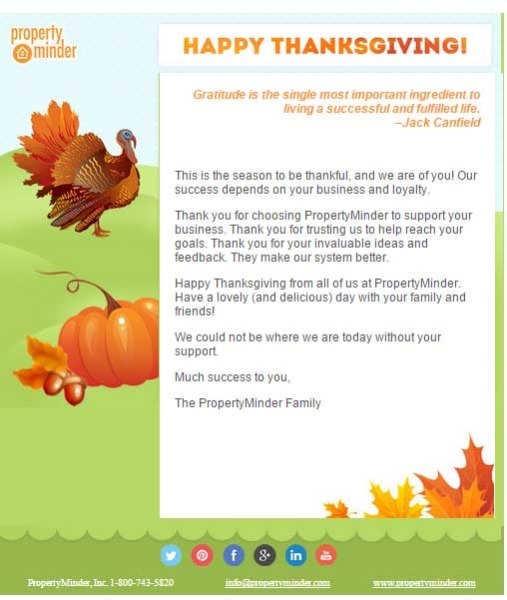 This entry was posted on Friday, October 7th, 2016 at 10:00 am	and is filed under Customer Success Stories, Email Marketing, Featured, News & Updates, Online Marketing. You can follow any responses to this entry through the RSS 2.0 feed. Both comments and pings are currently closed.